In fact, this new amplifier isn’t even your father’s Elekit. Up to now, Elekit power amps have been single-ended (not push-pull), and except for the 300B-sporting TU-8300R, a bit underpowered in my estimation. Not that there’s anything wrong with that – as long as you have a sympathetic room and speakers. With the TU-8340VK, Elekit is going mainstream in a big way. It’s a push-pull amp that can use output tubes ranging from 6L6GC’s (32wpc ultralinear, 18wpc triode) to KT150’s (50wpc ultralinear, 28wpc triode) and tubes between these two extremes including EL34’s and 6550s’, to name but a few. The user can even switch between ultralinear and triode mode ‘on the fly’ – the partial disassembly required to access jumpers, as was the case with some earlier Elekit amps, is a handy switch with the 8340. Four 12AT7/ECC81 tubes are employed, for phase splitting and voltage amplification duty. But let’s back up a bit to 2016. Victor Kung (of vkmusic.ca) is the North American distributor of the Japanese-made Elekit audio products. Calling Victor a distributor is a disservice, it sounds cold and commercial. Victor is passionate about good sound and the DIY hobby, first and foremost. I met Victor last fall at TAVES, the audio/video show near Toronto. Victor had travelled across the country for the show! Shows of any sort are to me, a bit of a drag. Going to a boat show is not like going boating. Going to an audio show has little to do with enjoying music. In a way, meeting Victor was the highlight of the day for me. I introduced myself, and asked Victor about the possibility of reviewing the TU-8340VK. He was a bit non-committal, but I can’t say I blame him for being reticent about letting any cowboy with a soldering iron (me), get his hands on one of his babies. Victor called me a few months later, but was still a bit vague about amp availability. I suspect the new amp has been selling quite well and Victor doesn’t really need a review to publicise it. At any rate Victor called again in mid-February to say he was about to ship me an amp and did I want a kit or assembled? Kit, please, I like to build stuff. A few days later, FedEx dropped off a box larger and heavier than I expected. The goodies inside were packed, Russian doll-like, in one triple wall and two double wall cardboard boxes. Christmas in March! I think it was actually about 50 years ago that I built my first Heathkit, a Christmas gift from my parents. To give you an idea of Victor’s passion for good sound, he has commissioned some special parts for this amp. He ordered special production runs of Takman 2% carbon film resistors to replace the stock Amtrans 5% resistors normally supplied by Elekit. Even more impressively, he paid a substantial sum of money in development costs for (optional) custom-made output transformers from Lundahl in Sweden. Victor offers the purchaser of this amp a variety of output and small signal tubes, or the end user can supply his own tubes. Various Mundorf coupling capacitors are also offered, as an optional upgrade to the (fairly decent) stock Panasonic caps. Eight caps are required for an upgrade. The amp I built came with the stock Elekit output transformers, the Amtrans 2% resistor option, and eight Mundorf EVO Supreme caps. I installed the stock Panasonic caps and will replace them with the Mundorfs partway through the review. The AC cord supplied with the kit has two prongs with a separate ground wire. I suggest to replace this with a proper 3 prong cord so that the chassis of the amplifier will be safely grounded. There are one large and five small circuit boards. These are supplied in one sheet and must be broken apart. Perforations between the sections make this fairly straightforward and easily accomplished over a sharp table edge. Still, it’s a bit disconcerting to snap a circuit board. It would be nice if Elekit would do this. The speaker terminals are on small sub-boards mounted (quite securely) at right angles to the main board. Solder is then flowed across the pads on the boards to form the connection. I added small L-shaped pieces of cut off resistor leads, for a “belt and suspenders” approach to making the connection. To make soldering easier before starting assembly, I wiped the boards with alcohol to remove any residue. I also wiped the pins on the tube sockets, relays, switches, RCA jacks, board mounted connectors, AC power inlet and fuse holder with alcohol as well. The main board is mounted to the chassis in twelve places, but what is especially confidence-inspiring is that each output tube is supported directly under its socket. Most parts in a tube amp (tubes aside), are fairly rugged in a mechanical sense. The exception being the glass-cased zener diodes. Use a pair of needle-nose pliers to support the leads exiting the diode, when bending them in preparation for inserting into the board. I must say, the R-core power transformer is especially impressive. This is not an inexpensive-looking item. It also runs a lot cooler than any Hammond I’ve come across, and even the power transformer in my ARC Ref 110. The trickiest part of the assembly that I experienced, was applying the chassis labels straight. Now this is not my first rodeo, but I still slavishly followed the instructions, took my time and triple-checked everything, especially the polarity of the electrolytic caps and the diodes. Without rushing, I assembled the amp in about ten hours. I’d say the assembly instructions are 99% there. I found a small resistor value discrepancy between the instructions and the schematic (the instructions and supplied parts were correct), and Victor answered my email query about it within ten minutes! 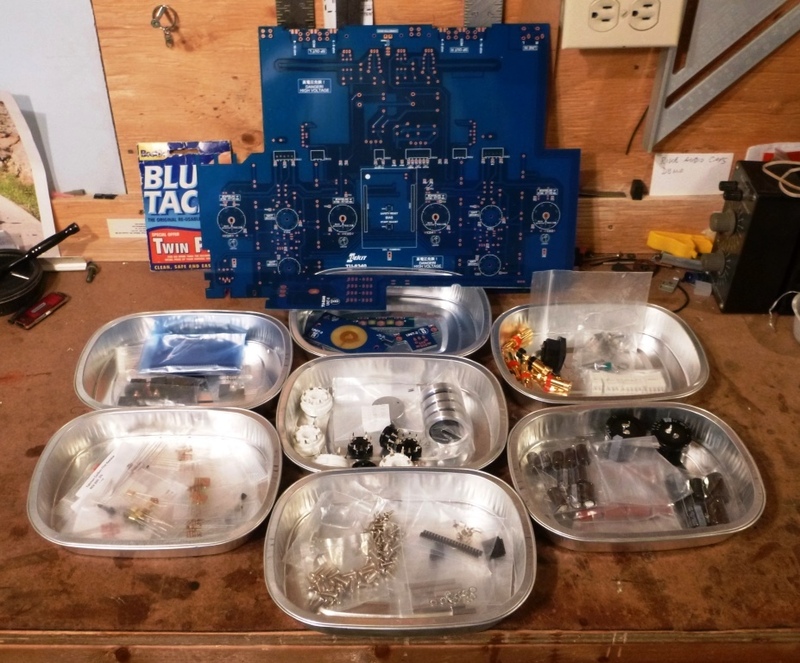 You might be asking yourself: “Should I attempt this kit?” If you’ve never done any electronic assembly or repair, I’d say no. If you want to tackle an electronic project, start with a smaller, lower-voltage kit like the Elekit TU-8500 preamplifier, or the Aikido line stage. Well, I guess I am a little, in favour of tube amps. There are different classes of electronic bias. Classes A, AB, B, and other letters as well, but we’ll save that discussion for another day. Bias, for the uninitiated, is a bit like the idle RPM’s on a car engine. There is a certain minimum speed the engine must be turning, or else it will stall. Bias in an amplifier is about setting the current through the output tubes, to ensure optimum operation. Too low, and the sound will be distorted, too high and the tubes will be overly stressed and won’t last very long. A car engine won’t idle at 100 RPM, and won’t last long if it’s run continuously at 7,000 RPM either. The nomenclature is a bit tricky, though. Cathode bias, like in some of the old Dynacos and other classic tube amps, is simply set with a current-limiting resistor. This works for average spec tubes, but doesn’t allow for variation in tube manufacture, and tube aging. It also won’t typically allow for use of a different tube in a given amp. You can’t just plug, say, a 6L6 tube into an amp designed for a 6550. The other most common kind of bias is fixed bias. And fixed doesn’t mean set to a certain value and ignored forever. Fixed bias is actually adjustable (dumb nomenclature, huh? ), where the user fixes (adjusts) the bias to an optimum value. There are two ways of doing this. The old-fashioned way, like my ARC Ref 110, where you remove about twenty screws securing the cover, then probe some points on the PCB with a volt meter and adjust small controls with a screw driver, is a chore. It’s time-consuming, and also a bit daunting – especially with several hundred volts nearby and hot tubes waiting to sear your flesh. It’s a shame that the case hides so many pretty internal parts! The TU-8340VK uses a modern, and far less fraught approach to setting bias. It also allows the use of a wide range of tubes. Elekit calls this “Semi-Automatic Bias Adjustment”. In essence, a microprocessor reads a voltage for each output tube (whichever tube the user chooses), then adjusts the bias voltage (for each tube) for optimum current flow. A plug-in module on the main circuit board performs the bias setting. At first time turn-on of the amp, or whenever output tubes are changed, the user should immediately press the “Safety Reset Button”, the rear most button between the two middle tubes. The LED’s in front of each power tube will flash red and green a few times, then stay lit green. After a minute or two, to allow the tubes to reach operating stability, the user presses the “Start Adjust Button”. The LED in front of each tube will flash from red to green a few times, then go out, indicating that the bias has been set correctly. The bias setting is stored in non-volatile memory and saved for the next time the amp is powered up. If at any point an LED flashes green or red continuously, there is a problem with the amp or tube, and corrective action should be taken. Bias through the small signal tubes, the 12AT7s, does not need adjustment. For you circuit nerds (like me), the phase-splitter and voltage gain tubes employ constant current sources. When a new tube set is installed, their characteristics will likely drift a bit while they break-in. It’s probably worthwhile pressing the “Start Adjust Button” during the first few listing sessions, after about ten minutes of operation. If you’re OCD like me, you’ll likely press the “Start Adjust Button” ten minutes into every listening session. Note: music should not be playing through the amp when the bias adjustment is being made. You might wonder, ‘What happens in 10 years if the Semi-Automatic Bias Adjustment module dies?’ In the unlikely event that Elekit can’t supply you with a new module, I’m sure other options will pop up. Some smart people will likely figure out a way to have their tablet or phone link to the amp and adjust bias. If that doesn’t happen then some old geezer (like me) will surely come up with an old-school solution that involves trimmer potentiometers and voltmeters (it’s not that daunting a process), to keep this amp going well into the future. Don’t laugh, I recently rebuilt an approximately fifty year old 6V6-sporting Bogen PA amp into a guitar amp for my buddy Paul. So if you’re concerned about leaving a legacy of a serious piece of HiFi gear to a relative or friend, I don’t think you should worry about the viability of this amp, or any other Elekit. In part 2, I’ll get to the listening tests. The amp is still breaking in – I’ve had a few short listens so far and if what I’ve heard holds, the TU-8340VK could be a significant amp for not only DIY’ers, but tube lovers and music lovers too. I’ve also been offered the kind loan of some tubes by Jon at Thetubestore.com, so I’ll be doing some tube rolling as well. All in all, I think I’ll have a lot to report to you faithful WoS readers. I also want to try the TU-8340VK in at least one other system. I’ll try to have part 2 out in the next 10 to 12 days. Elekit TU-8340VK basic kit (no tubes): $1250 USD. Elekit TU-8340VK Review (Part 2): Could This Be Your Last Power Amplifier?